YEREVAN, NOVEMBER 3, ARMENPRESS. Armenia President’s Global IT award 6th recipient Yevgeny Kaspersky will visit Armenia to receive his award from November 16-18 with his wife and 5-member group of workmates. It is expected from his visit that he will get more thoroughly acquainted with the possibilities of information technology in Armenia and the activity of “Kasperky’s laboratory” will be expanded in Armenia. 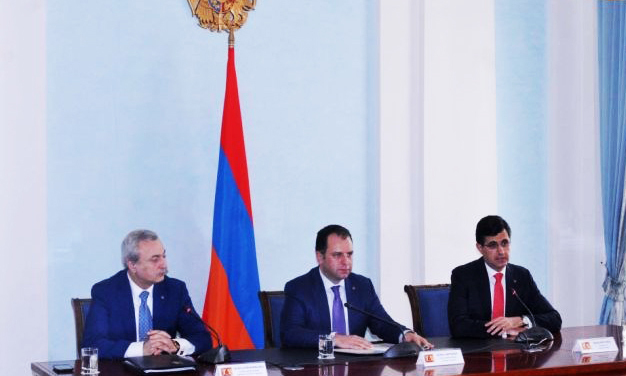 As “Armenpress” reports, the Chairman of Executive Board of the Award,Synopsis Armenia Executive Director Hovik Musayelyan informed about this during the press conference in Armenian Presidential residence. “It was difficult to select the best candidate for the committee and the selection committee”, Hovik Musayelyan said. According to his speech, one of the most significant points of the mentioned awards is that the prize winner should visit Armenia, have meetings with Armenian higher officials and then pass master lessons for students. In the frames of Kasepersky’s three-day visit to Armenia, it is intended to pass a meeting with ICT community and with students in Tumo centre, as well as a traditional visit to the Engineering University where the prize winners are being awarded a University honorary doctor degree, but as he was already awarded that honor, he will be awarded by the golden medal of Engineering university this time”, Musayelyan informed. According to the speech of Vigen Sargsyan. Chairman of GIT Award Committee, Chief of Staff to the Presidentof the Republic of Armenia, among other initiatives and events, it is designed to emphasize the importance of IT sector for Armenia and the expectations that Armenia has in the development context of the mentioned sector.